The annual Consumer Electronics Show in Las Vegas is a showcase of what's new and upcoming in the world of gadgets. Every year bigger TVs, sleeker computers and more powerful handheld devices are rolled out for the press to report on. And along with the shiny innovation on display are a few products can be...off the beaten path. Here are five gadgets we saw at this year's show that caught our attention, but possibly not for the best reason. The key to optimal digestion is to eat slowly and chew thoroughly. Eating too fast can cause you to overeat. That's because it takes your body some time to tell you it's full, so you continue to eat when you should stop. 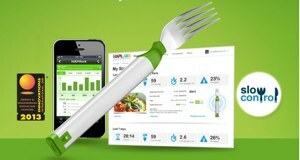 HAPIlabs believes they have the solution with their new HAPIfork. The fork tracks how many mouthfuls you take per minute and vibrates when you're eating too fast. The idea is a good one, but who wants something electronically slapping their hand at the dinner table? HAPIlabs is starting an investment round in February for the HAPIfork and plans to sell at $100 when it ships sometime later this year. Last Fall Sony got into the sports camera business with their new Action Cam line. To compete in this growing field, they have introduced a number of accessories so various extreme sports enthusiasts can record their daredevil exploits. 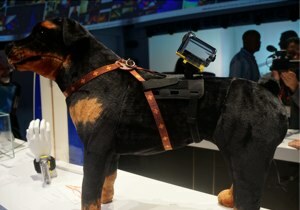 The most curious one we saw at the Sony booth was the prototype of a pet-mount harness. Strap this to Fido, insert the camera, and record his adventures chasing squirrels and catching Frisbees. Right? Unless your precious pooch can skateboard or windsurf, this new accessory might be better left as a concept. You like music, right? And you like a good massage. The iMusic BodyRhythm wants to put those two together with its massaging vest that pulses to the rhythm of your favorite music track. 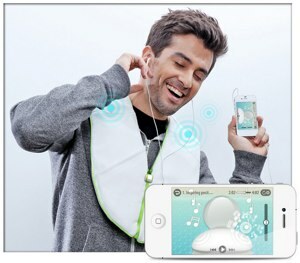 The associated iPhone app links to the playlists on your phone and the vest translates the beat into "a physical experience." We're not sure if this is a good thing, but it probably depends on your taste in music. The iMusic BodyRhythm is still in the development stage and is gathering investment money through a Kickstarter fundraising page. Here's another, ahem, innovative way to listen to music. 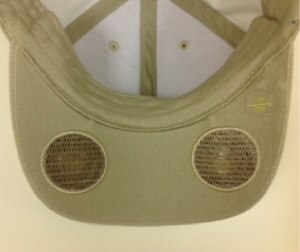 The Skull Blaster Speaker Hat uses Bluetooth technology to wireless stream your phone's music to the hat. Two speakers embedded under the bill of the hat pumps out the jams. The speaker hat is advertised as the alternative to those that don't like earbuds, but do you really want to inflict your musical tastes on everyone around you? The Speaker Hat is currently available for $40 on the official site. 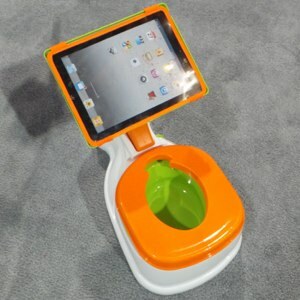 Training kids out of diapers can be difficult and CTA Digital feels they have the answer: bribe them with iPad time, Their iPotty for the iPad is a standard plastic toilet training kit, but this one comes with a stand that can hold an iPad. A plastic slipcover protects your precious electronics while your wee one amuses themselves on the potty. The manufacturers claim this helps with kids being bored while being potty trained. Given the number of adults that take their mobile devices into the bathroom, they may be on to something. The iPotty for iPad is due later this year. No price was announced. Whacky or revolutionary, the Consumer Electronics Show never fails to deliver every year. We can't wait for next January to see what, if anything, can top the iPotty.